I grew up in an Italian family and Olive Oil flowed as freely as water. Everything was cook with Olive Oil. I didn't even know there was an alternative until my late 20's. Then when you start looking into cooking oils and your options to find out that many of the oils we use for cooking are overly processed and many are not healthy to be heated to the temperatures we heat them to! Avocado oil is pressed from the pulp of the fruit. It has a very mild aroma and a creamy rich texture. It almost has a slight buttery and nutty taste. I personally love cooking with it! Avocado oil also has a high smoke point of over 500 degrees Fahrenheit. This makes it a great option for sautéing and baking with. Coconut oil also has a high smoke point as well at 350 degrees Fahrenheit, however I don't enjoy the coconut taste it leaves behind on my food. While Olive Oil only has a smoke point of about 320 degrees Fahrenheit, I don't know about you but I rarely cook in my oven with the temperature set at 320 or lower. Making it unsafe to cook with this oil in the oven. This is important because heating past the smoke point can cause toxic fumes and excess free radicals. 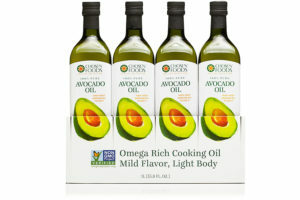 The great news in Avocado oil is showing up in more and more stores!!! It is becoming much easier to find. So I challenge you, the next time you buy cooking oil for your home grab the Avocado oil and give it a try!